A philosophy shared by East and West: “Eternity exists in a moment and the whole world is in a speck of dust”. Thus, if one universe is a part of the bigger one, and if “all is one and one is all”, we can regard all ourselves as one — from the tiniest atom to the largest universe. Everyone is a part of everything and all is interconnected: this is the core message of “Road of Light and Hope” whose ancient Eurasian wisdom arrived in Japan 1300 - 1500 years ago via the Silk Road and even today survives in the form of art. 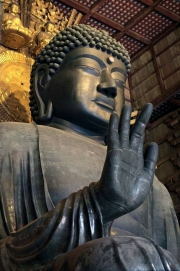 The Eurasian trail where this all-inclusive vision was fostered, and where beauty and wisdom interacted as a “Road of the Vairocana Buddha’s introduction to Japan”, is an inspiration for oneness of all, transcending East and West, as well as North and South. The retrospective exhibition at the Byzantine and Christian Museum presents a selective overview of the painter career (1966-2017). The twenty one works on display reflect the artist’s lesson of byzantine and post-byzantine art and reveal his personal interest for the Macedonian School which Balogiannis translated with bright and intensive colours. Gregoris Balogiannis introduced new iconographic themes as the Christ Creator of the World and the Virgin of Tenderness. 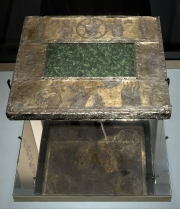 The travelling exhibition “Treasures of the Middle Ages” first opened in 2007 and was presented at different cities in Poland and in the rest of Europe: Germany, Ireland, Finland and Norway. The exhibition presents 445 objects, mainly jewellery, some of the most precious and representative items from the collections of the State Archaeological Museum in Warsaw. 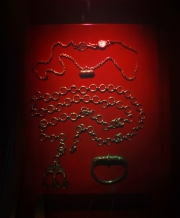 Artifacts, dating from the 11th to the 13th century, were made of various precious materials (silver, gold, copper alloy, glass, semiprecious stones) and either were unearthed during the last century in archaeological excavations in Poland, Belarus and Ukraine or donated by private antiquities collectors of the 19th century. An open Small Sculptures Exhibition, with no specific theme, is presented by The Chamber of Fine Arts of Greece in the outdoor area of the Byzantine and Christian Museum. In the context of the annual icon painting competition organized by the Interparliamentary Assembly on Orthodoxy (I.A.O.) www.eiao.org, the exhibition «The Resurrection of Jesus Christ» is hosted at the Byzantine and Christian Museum from June 25th to July 22nd 2018, presenting 63 works which participated in the competition, after being selected by an international experts’ jury. The exhibition of the Byzantine and Christian Museum emphasizes the role of the Byzantine Empire, between 300-1000 AD, as a pole of stability in a period of great uncertainties and conflicts (upheavals and reversals) in the European world as well as in the broader Mediterranean area. Estonia has always been a borderland on Europe’s religious landscape. 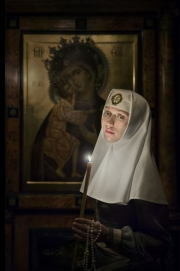 To the east of the country lies the Orthodox world; in the other directions the Western church has always held sway. Orthodox Christianity has never been the dominant religion in these parts, but at different times and in different places it has nevertheless played a significant role – primarily for the Russians who have lived here, but also for Estonians, and in particular Estonians residing in the easternmost parts of the country. 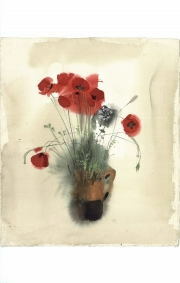 The exhibition “The wild flowers of Varlamos”, organised by the Central Committee of the Communist Party of Greece, presents the works of the painter-engraver Giorgos Varlamos around wild flowers. The exhibition includes 120 works (oils, watercolors, drawings, engravings) and is structured in three sections: “Wild Flowers”, “Meteora” and a third section with drawings and engravings from the period of the Dictatorship in Greece. Along with Varlamos artistic work, the exhibition presents a small part of his workshop: his engraving tools and personal items, which bring his work and action into life. 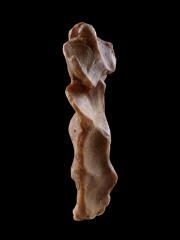 Cycladic snapshots. Monuments and People. 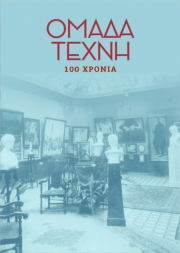 This exhibition, organized by the Ephorate of Antiquities of Cyclades in collaboration with the French School at Athens and the Byzantine and Christian Museum, brings together a selection of “snapshots” starring those who worked to uncover, protect, and enhance the unique archaeological and cultural wealth of the Cyclades from the late 19th century to the present. It includes one-of-a-kind archaeological exhibits from the islands, most of which are being exhibited for the first time. The Galleria Giorgio Persano-Torino in collaboration with the Italian Cultural Institute of Athens is presenting an exhibition by the Italian artist Alfredo Romano, Angelis suis mandavit de te, at the Byzantine and Christian Museum. The exhibition includes works from the late 80’s to the present, together with works and installations made specifically for this exhibition in order to establish a specific and complex dialogue with the items in the museum’s own collections. A JOURNEY ΤΟ THE HOLY LAND through the proskynetarie from the Byzantine and Christian Museum. In more recent times, beginning in the 16th century and culminating in the period between the 17th and 19th century, systematic information regarding the holy pilgrimage sites that must not be missed by the visitor are given in manuscript and printed proskynetaria (pilgrim’s guides) to the Holy Land. These travel guides, usually illustrated, are intended for Orthodox Christians and contain information regarding the stations in Christ’s earthly life and Passion. The illustrations of the Proskynetaria mark spatial entities which serve as a map of the holy shrines, a holy geography of the places through which Christ passed during his earthly life. 2017 marks the 100th anniversary since the creation of the famous “Techni Group”, which has been identified—in the consciousness of those who deal with the history of modern Greek art—with the birth of modernism in Greece. Was the role of the “Techni Group” so crucial, in the few years that it was active? Did it truly revitalize the art scene in the capital, which was oversaturated with the long-standing dominance of the Munich School? What was the Group’s relationship with Venizelos’ policy, which embraced the young artists’ initiative from the very first moment? The anniversary of the centenary offers an opportunity for a fresh look on the “Techni Group” through a showcasing of the works themselves. 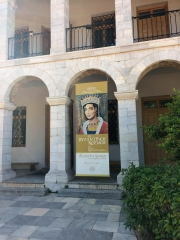 The Byzantine and Christian Museum hosts the exhibition “The Byzantine World” of Elias Kontozamanis. The exhibition illuminates the personal painting approach of the historical narrative of a thousand year empire, the Eastern Roman Empire. The installation consists of 16 loudspeakers playing “a symphony of frogs croaking.” The sound archive is made of a) frogs croaking b) human voices imitating frogs croaking c) human voices reciting proverbs d) human voices reading parts of Aristophanes’ play “Frogs”. Both Aristophanes’ “Frogs” and Ben Patterson's earlier work “Pond” have influenced the development and the artistic result of this work. The exhibition with Treasures from the Collections of the State Hermitage Museum is the culmination of a series of exhibitions and events which the Byzantine and Christian Museum staged in 2016 to celebrate the dedicatory cross-cultural year ‘Greece in Russia, Russia in Greece 2016’. The exhibition “Icons from the State Tretyakov Gallery’s Collection. The Russian Icon Painting after the Fall of Constantinople” is presented within the frameworks of the events celebrating 2016 as the year “Russia in Greece – Greece in Russia”. The exhibition was preceded by the presentation of a distinguished icon of the State Treytakov Gallery’s Collection, the icon of the Ascension, connected with the famous religious painter Andrej Rublev. 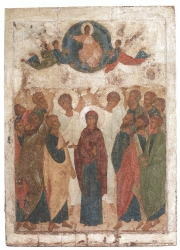 Officially presented by the President of the Russian Federation Mr. Vladimir Putin and the Greek Prime-Minister in May 2016, the Ascension icon will remain in display in our Museum premises and contribute, along with the newly arrived icons, to make the Byzantine Museum visitors acquainted with Russian Religious Painting. ANDREI RUBLEV. A God inspired religious painter. The icon of the Ascension, painted by the famous Russian religious painter Andrei Rublev in 1408, came from the Tretyakov State Gallery to the Byzantine & Christian Museum to be displayed from June to September 2016. It is a forerunner of the works from the Tretyakov State Gallery and the Hermitage Museum that will be exhibited at the Museum within the cultural activities celebrating 2016 as the year of “Russia in Greece and Greece in Russia”. Saint Andrei Rublev, a monk and God-inspired religious painter (late 14th century-circa 1430), is a symbol of the Orthodox Russian art. His works, revealing high artistic charisma and ascetic spirituality, are among the most splendid examples of Russian religious painting. The exhibition was sponsored and co-operated by Prometheus Gas, a company of Gazprom and Copelouzos Group. "Armenia. The spirit of Ararat from the Bronze Age to the 20th century"
The Byzantine & Christian Museum hosts for the first time in its halls a historical exhibition of archaeological findings and cultural treasures of Armenia. 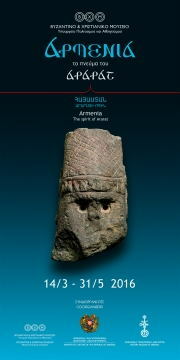 One hundred and four objects from the Yerevan History Museum become witnesses of the history of Armenians since prehistoric times and highlight their Hellenistic and Byzantine past ―the Armenians were subordinates to the states of Alexander the Great and his successors, and citizens, allies or friends of the Byzantine Empire. In 2015, the Byzantine & Christian Museum is honouring Fotis Kontoglou (1895-1965) on the 50th anniversary of his death; the Museum dedicates to the artist a major retrospective exhibition that presents Kontoglou’s multifaceted contributions to 20th-century Greek culture as an artist, a painter of religious and secular works, a writer, a critic, a colour researcher, a conservator. Born in the Holy Land, the cradle of the monotheistic religions, Christianity has maintained a constant presence in the area since the first day of its inception. Twenty centuries later churches, monasteries and convents of all denominations are still part of the natural landscape either in the heart of cities, hilltops or in remote desert regions. 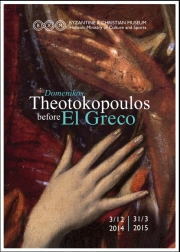 "Domenikos Theotokopoulos before El Greco"
This is the first exhibition which attempts to interpret Domenikos Theotokopoulos in terms of the social and cultural environment which impacted on his artistic choices. The exhibition is in three parts. Each participant chooses one of the above words or any other word from the dictio-nary that includes the preposition “dia” (inter- in English). The votive offerings by Dimitris Condos (1931-1996) is a group of 14 works that has been presented for the first time in the art Gallery Desmos in March 1975. The artist chose to work on the synthetic dipole icon and valuable devotional offerings, primarily jewelry in several variations, in order to comment on current political and social issues. The Byzantine & Christian Museum is celebrating in 2014 the centenary of its foundation. In the context of scholarly activities that it organizes in common with Museums and Institutions worldwide, the Byzantine & Christian Museum collaborates with the Cluny Museum in Paris, one of the most important Museums in France dedicated to the Medieval Era, and is inaugurating an exhibition cycle under the general title “Byzantium and Medieval Western Europe″. The purpose is the parallel presentation and the comparison of western and eastern artistic, theological, social and cultural aspects of the Middle Ages. The retrospective of the painter Fotis Sarris at the Byzantine and Christian Museum, two and a half years after his death, illuminates for the first time his artistic journey in its entirety. Simultaneously, it presents his relationship with the Byzantine art, a relationship which has hardly been studied and commented until now. The exhibition attempts to highlight the interactive relationship of the artist with the content and the patterns of the Byzantine painting tradition that is expressed through a deeply personal and primarily political artistic creation. Fifteenth-century Europe witnessed the development of a distinct type of religious painting which combined novel iconography with extensive texts. A form of illustrated sermon, these “talking icons” would figure in the religious disputes centred on the reform of Church and society that raged across most of 16th- and 17th-century Europe as all sides sought to establish broad social alliances. This exhibition includes three such paintings from the collections of the Byzantine and Christian Museum: The Wisdom of God, The Trial of Christ and The Living Cross.The exhibition is part of the “Exhibit of the Month” series introduced in Greece by the Byzantine and Christian Museum. A common practice in major European museums, the “Exhibit of the Month” seeks to present to the public museum objects that are not particularly well known. A Temporary Exhibition Within The Permanent Exhibition. Museums Make Connections. The extrovert communication policy of organizing exhibitions that highlight objects outside of their collections has become an established practice of museums internationally. The benefits are many: the promotion of scholarly knowledge, of research and documentation, the recontextualization of the archaeological items, the cooperation and networking of museums, but most importantly, the increased accessibility. The use of display holography for visual recording of objects of cultural interest and their further presentation to wide public has already been applied on multiple occasions since the early 80s. Scythian treasures, religious relics, archaeological and anthropological findings as well as historical works of art have been made available for holographic recording from famous Museums such as the British Museum in London or Hermitage in Leningrad of the (then) USSR. 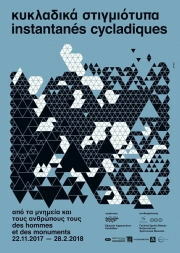 Tassos Triandafyllou, Identities. Baloukli and the Romioi [Greeks] in Constantinople, 19th c.
The exhibition is structured in two parts and, therefore, possesses artistic as well as archaeological interest. The artist Tassos Triandafyllou presents fifteen works (graphite on paper), in which he imprinted, during the summer of 2010, fifteen gravestones that today pave the courtyard of the Greek-Orthodox Monastery of Baloukli in Constantinople. 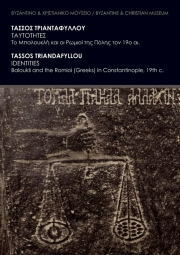 Since the works created by Tassos Triandafyllou provide valuable information about the Community of the Romioi (Greeks) of the 19th-c. Constantinople, the Museum considered appropriate and interesting to present these works accompanied with relevant information and archaeological material from its Permanent Collections. In this way the contemporary creation is incorporated into the sociopolitical context of the 19th c.-Constantinople, and the exhibition acquires chronological, geographical, sociopolitical and artistic relevance. 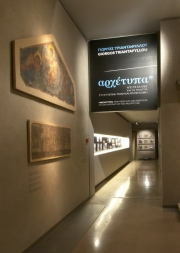 Τhe Byzantine & Christian Museum inaugurated the temporary exhibition Leontios Machairas’ Exegeses by Lefteris Olympios. The twenty four drawings and the sketchbook that are presented in the exhibition were created in order to illustrate the publication Leontios Machairas, Exegeses in Remembrance of Time and Place by Natia Anaxagorou. 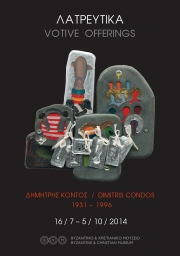 The Byzantine & Christian Museum exhibits 26 of the 27 «Great Books of the Artists» published by Stratis Eleftheriadis (Teriade) in Paris from 1943 to 1975. The Greek cosmopolitan chose to work with great artists, architects, painters and sculptors of the 20th century, by proposing them the creation of editions. The cooperation of the Byzantine & Christian Museum with the Danish Embassy in Athens is part of the celebration programme for the 200th anniversary of the birth of the Danish philosopher and religious thinker Søren Kierkegaard (1813-1855). The Byzantine & Christian Museum, in collaboration with the National Museum of Belgrade, organizes the exhibition “Serbian Μedieval Art”. Τhe medieval culture of Serbia was permeated with West European and Byzantine influences. This Balkan state, Serbia, independent (from 1180 onwards) and powerful under the leadership of Nemanja Dynasty (1166-1371), stood always between the Byzantine world and the West. The exhibition deals with the Greek presence in Sicily from the Βyzantine era to the 19th century, focusing on the city of Messina, where a flourishing Greek Community existed. A number of Βyzantine and post-Βyzantine icons from the Community’s Church, Saint Nicholas “of the Greeks”, has been the starting point for the exhibition project. The icons were rescued from the ruins of the church by the crew of the Greek warship “Sfakteria” shortly after the big earthquake of the 28th of December 1908, which devastated the city of Messina. They were immediately transferred to Athens, in safety, and a few years later, in June 1915, they entered the Collection of the newly founded (in November 1914) Byzantine & Christian Museum. The painter Kostas Papastamoulis, following the practice of painting historical sites, which refers to a long artistic tradition, focuses on his recent works on the Akropolis rock. He depicts the site as seen from every corner of the city, at any time of the day, in different weather conditions, and links his main subject with the Byzantine, post-Byzantine, and Ottoman monuments. Yiannis Kastritsis' "Interpretation of Lives"
The painter Yiannis Kastritsis through his exhibition Interpretation of Lives in the Byzantine & Christian Museum becomes part of the chorus of contemporary artists who are inspired by Byzantine tradition. Garden & Paradise. Metaphor and Reality. Lefteris Olympios’ exhibition “Facing Byzantium” contains selected works representative of his artistic creation (1993-2012). It is also a response to an important aspect of art:the contemporary artistic idiom can reformulate religious iconographic themes in a fascinating way. 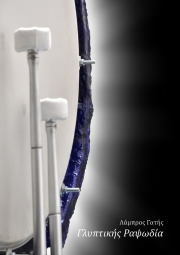 Helen Apostolopoulos brings her unique sculptural forms, borne in part of her study of important archaeological collections and monuments, to the Byzantine Museum. Her years in the Hellenic Archaeological Service brought her into contact with important examples and groups of muralled monuments, which she studied methodically and drew with artistic flair. "Byzantine Salento. Through the camera of Foteini Kaimaki"
The Salento region in Southern Italy includes the province of Lecce and parts of the provinces of Brindisi and Taranto. The region was contested by the Lombards and Byzantines from 476, year of the fall of the Western Roman Empire, to 876, when it finally became a Byzantine holding. After the Norman conquest of 1071 the Byzantines left Salento. Byzantine culture and practices survived into the following centuries however, enduring in church fresco decorations up until the 14th c. and in the use of the Greek liturgy until the 17th c.
Founded in 1914, the Byzantine and Christian Museum is one of the oldest museums in Greece devoted exclusively to Byzantine art and civilization. The whole of the museum’s collection of manuscript codices and incunabula highlights valuable material. For the exhibition in the Byzantine & Christian Museum Theodoros Papagiannis chose to present representative works from his artistic production from the last 15 years in a really new concept. The bread, a symbol of great importance for Christianity and a favourite subject for the artist, is the core around which the narrative of the exhibition is organized. 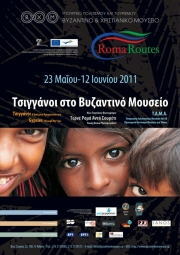 On Wednesday, April 4th 2012 at 19.30 is inaugurated in the Byzantine and Christian Museum the exhibition of Ioannis Lassithiotakis "Faces". The artist presents 30 works, which he created during the last few years. Per Kirkeby: A creative dialogue with Byzantine art. Per Kirkeby, one of the most important neo-expressionists artist in Denmark, is presented for the first time in Greece, in an exhibition that depicts his development through 29 selected works. Painter, sculptor, writer and poet Kirkeby is inspired by Byzantine art which he approached with his particular personal style. Athens International Airport, in the framework of its cooperation with the Byzantine & Christian Museum, hosts at its premises a photo exhibition of the Museum’s Permanent Exhibition. 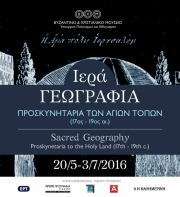 The exhibition is presenting about fifty paintings depict mainly landscapes and monasteries of the Mount Athos. The European Investment Bank’s art collection, which comprises some 550 works of art (paintings, photographs, works on paper, sculptures and installations), features the creations of both emblematic and emerging figures in contemporary art. "Wall paintings from Steni, Euboea, the repatriation"
The Church of the Palaiopanagia, a cross-vaulted structure, stands in an isolated location between the villages of Loutsa and Steni on the island of Euboea. Its wall paintings are artistically noteworthy and may date from the latter half of the 16th century. 20TH- AND 21ST-C. WORKS FROM THE COLLECTIONS OF THE BYZANTINE MUSEUM. 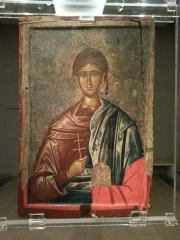 The Byzantine and Christian Museum boasts an excellent collection of modern and contemporary art. Most of the works in the collection are copies (paintings, casts, mosaics, wall-paintings) of works by 20th-century artists from Greece and abroad, as well as by artist-conservators who have worked at the Museum. Sophie Barbe de Marbois, Duchesse de Plaisance (1785-1854). 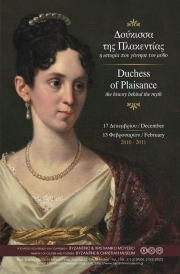 Ηow many people know the name of the Duchess of Plaisance? Contemporary church art: Architecture & Painting. 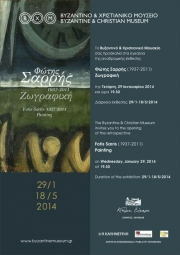 This exhibition of works by contemporary architects and icon painters at the Byzantine and Christian Museum was held in parallel with the “2nd Academic Symposium on Modern Greek Church Art”, which has been organized by the University of Athens, Faculty of Theology in collaboration with scholars from departments of Architecture and Engineering at the University of Patras and elsewhere. The Lambros Gatis exhibition was presented in the Byzantine and Christian Museum in Athens under the title Sculpture Rhapsody, included a series of audiovisual sculptures. The Byzantine art was a subject for dialogue in the artistic community during the first half of the 20th c. The presented artists participated in this discourse concerning the value of the Byzantine art and incorporated afterwards elements of its heritage in their work. The periodic exhibitions of the Byzantine & Christian Museum (BCM) host the opening of the exhibition and the presentation of the book by the architect Giorgos Triantafyllou. 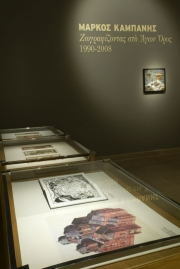 Both the exhibition and the book are dedicated to the memory of the late Director of BCM Dimitris Constantios. 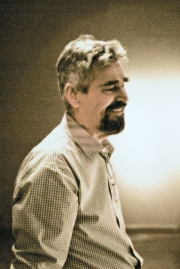 The relationship of Markos Kampanis with the Community of Mount Athos began in 1990. A first trip, which was to be followed by many others till today, was enough to bind him emotionally and artistically with the place and the people. The current exhibition at the Byzantine and Christian Museum presents more than one hundred works through five thematic sections, extensive samples of the twenty year activity of Markos Kampanis associated with Mount Athos. Andy Warhol (Pittsburgh 1928 – New York 1987) is considered one of the most important artists of the 20th century. He played a leading role in the Pop Art movement in America from the early 1960s. Taking the Museum’s collection “Refugees’ Heirlooms’ as its starting point the exhibition traces the links between the objects and the people. The series of studies by Konstantinos Kerestetzis on show in the “Study at the Prado” exhibition at the Byzantine and Christian Museum are the result of a creative visual dialogue between the young artist and the great masters rather than the distillation of a long period of learning. Although the art of enamelling has been known for centuries, it is now practised by very few artists. The Byzantine and Christian Museum is for the first time presenting an exhibition devoted exclusively to the art of enamel on metals. The exhibits cover a wide chronological and geographical spectrum. The exhibition held at the Byzantine and Christian Museum in honour of the artist and conservator Yiannis Kolefas is designed to project his multi-faceted work in the areas of conservation, creative art, and the teaching of the art of the mosaic. In the galleries in the Villa Ilissia, spectators follow Kolefas’s path as conservator, artist, teacher and man, through a significant part of his work. In 2007 the Byzantine and Christian Museum brought the Greek public closer to the great Spanish surrealist with the eccentric personality, by exhibiting works that have never come to Greece before. The Byzantine and Christian Museum, in collaboration with the Directorate of Museums, Exhibitions and Educational Programmes of the Hellenic Ministry of Culture, and with the National Museum of China, stages for the first time a major temporary exhibition that reveals unknown aspects of an influential and fascinating culture. 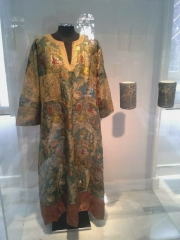 The period of the Tang dynasty (AD 618-907) is one of the “golden eras” in the history of China. 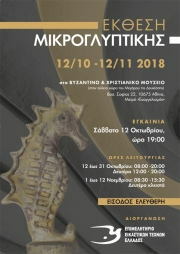 Byzantine and Christian Museum and the Municipal Center of History in Volos present the temporary exhibition "From Chioniades... Studies and anthivola"
The concept of the oecumenicity of Byzantium, the Christian empire of the East, is an extension of the theory of the universality of the Roman imperium. The Church of Greece is commemorating the 2000th anniversary of the joyful event of the Lord made Man. The culmination of its celebration is the exhibition "A Mystery Great and Wondrous", organized in the Byzantine and Christian Museum, Athens, in collaboration of the Hellenic Ministry of Culture.